The spring migration of Ruby-throated Hummingbirds is underway and they’re almost to Illinois now. Lanny Chambers in St Louis hosts a website hummingbirds.net where people can post and track their spring migration. Check it out! Now is a perfect time to clean your feeders, stock up on sugar for the season, replace old feeders, and add new ones. The more feeders you put out, the more hummers you’ll attract—so you can’t have too many! Here at Daybreak, we try to have our feeders up and ready by April 15, but watch the migration map to know when they’ll be in your area. According to The Hummingbird Society, tests have shown that hummingbirds prefer sucrose in flower nectar over other sugars such as fructose and glucose, so your feeder using the proper ratio of table sugar (sucrose), becomes a good approximation to the flowers hummers like best. Do not use honey, artificial sweeteners, sugar substitutes, turbinado, brown sugar, or anything except white table sugar because it can harm the birds. Hummingbirds are attracted to red, however it is not necessary to add red food coloring to their nectar. Most feeders have red parts and the food coloring adds no nutrition and could be harmful to the birds. 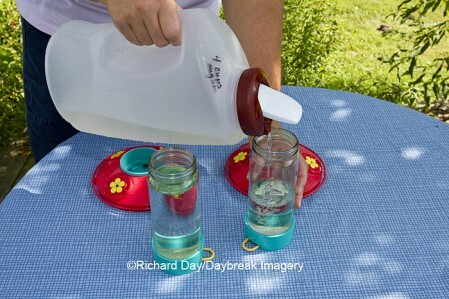 Experts recommend mixing a 1:4 ratio of sugar and water solution for hummingbird nectar. Bob Sargent, founder of the Hummer/Bird Study Group suggests the use of an open hand as a reminder of the sugar/water ratio. “The thumb represents one part sugar, “explains Bob, “and the four fingers represent the four parts water.” One cup of sugar to four cups of water is a good sized recipe to start with. If you have extra, you can store it in a covered container in the refrigerator for up to two weeks. How you mix that solution is a matter of personal preference. Some people just stir it all together and pour into their feeders. Others claim that mixtures do not spoil as quickly if you boil the water first, add sugar, stir, cool, and then fill feeders. However you do it, make sure your feeders are clean before refilling—a quick rinse each time you refill is usually all it takes. In early spring you don’t need to fill feeders completely full. Put out a bunch of feeders and gradually add more “juice” as more birds arrive. 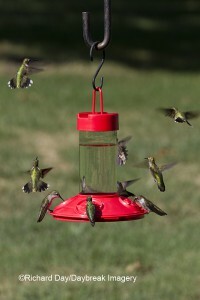 Our next blog will explain how to shop for a hummingbird feeder. This entry was posted on Tuesday, March 22nd, 2011 at 11:39 am	and is filed under bird feeding, bird photography, Birds, Seasons, Uncategorized. You can follow any responses to this entry through the RSS 2.0 feed. Both comments and pings are currently closed.